These animals have been fairly frequently seen in the Cosham and Purbrook areas for many years. For some years - the mid 90s to the mid noughties they also spread into Hayling Island, Southsea and to the north. For a couple of years up to 2010 there have been few reports and all of these have come from Cosham or Purbrook. More recently I have had reports from wider UK areas as shown below. New sightings and pictures will be very welcome. E mail them to me please. Only a few white squirrels are albinos, recognizable by pink or blue eyes and the absence of pigmentation anywhere on the body. The gene for such an absence of the pigment, melanin, is recessive, so each parent must carry it to produce an albino squirrel. Albino squirrels have vision problems and are at a disadvantage in the wild. Many white squirrels are genetic colour variants of the gray species, as are the less common black squirrel. They breed normally and may have gray siblings. It is thought that the genes that normally produce a white underbelly in the gray squirrel are active in a wider area of their bodies, often leaving discernible gray patches on the spine and head. It is also theorized that the white coloration may even provide some kind of survival advantage in the colonies where they do thrive. Partially white squirrels e.g. the Cheshire one listed below are described as Leucistic. The sightings are arranged geographically and recent entries are in italics Click on the names below to find records from your area. Hi, just seen a white squirrel in my garden 22.8.17 also saw it about two weeks ago but no picture unfortunately I didn't even know they existed until now was rather unsure as to what it was at first but having seen it again and checking it out am sure now, I am in Wickham Bishops Essex. Trevor Keeble. This morning (23rd Jan 2017)_at our toddler group in our local church hall, we were all singing nursery rhymes until I saw a pure white squirrel play and chase a grey squirrel up a big tree. Most of the parents and children couldn't believe our eyes. Amazing sighting. We live in a country village called Wickham Bishops, just outside Witham, Essex. Clearly spotted a white squirrel crossing the quite approach road to Chartwell House near Westerham Kent. A first for us! Here are a couple of photos of a white squirrel that I often see when I’m walking in the grounds at the University of Kent. These photos were taken this week. 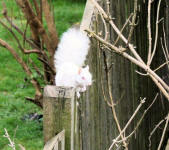 After years of hearing about the albino squirrel on the campus of University of Kent, I always thought it was a myth! On my way to see Dr Bike at the pavilion, to get our neighbour's bike fixed, I saw the completely white (other than its dark eyes) squirrel. It was like someone had created it from a 3D printer using normal white printing paper! We have just spotted a white squirrel living in a big old oak tree in our garden. We're in TN12, Tonbridge. Shauni Spafford On 4th May Shauni confirmed there are actually two white squirrels visiting her garden. I saw a white squirrel on 9th march 2018 in a park just off Hales Place in Canterbury. We have an albino squirrel living in the woods behind our house in Four Elms Kent. TN8 6NY... Cannot say if it's male or female..
My daughter and I saw a white squirrel as we were driving through Hadlow in Kent this afternoon (7th December 2017) at about 3.30pm. The squirrel was pure white with piercing black eyes. The squirrel looked healthy and was running along the tree and then along the ground. I’ve worked at the University of Kent, Canterbury for a few years and have often spotted a white squirrel on my walk to and from work but not for some months. I recently spotted this little albino one in the branches of a tree (17 October 2017) and he was there again last night. Had an albino squirrel in the garden this morning. Tonbridge area of Kent Karen Branard. Just seen my first ever white squirrel in our garden in Birling, West Malling, Kent. I did not get close enough to see whether it had pink eyes. . It was about half size of a fully grown grey and was with a somewhat larger grey - mother perhaps or sibling? Kind regards, Richard Harrison-Murray 13 may 2017. A white squirrel was seen in the area of TN40 2JD on 27 05 16 around 8am. Richard Swain. A white squirrel was seen in in Ramsgate Kent on 18th april 2016. Kev & Jordain Hill. My wife and I had a white albino squirrel (pink eyes) visit our West Wickham garden twice this afternoon (16 Jan 2015). We shall watch to see if it continues to visit us! David & Lynne Noble. I saw a white squirrel today on Hayes Common, Kent at 2.30pm, it crossed the ride in front of my dog and myself near West Common Drive. We often visit these woods but have never seen one before. Sally Carruthers 10th Jan 2015. An albino squirrel was seen near the windmill at Woodchurch Kent on 6th Oct 2014. Karen. I saw a white squirrel in my garden probably about 6 weeks ago. At first everyone I was probably seeing things! Thankfully the rest of e family saw it today (30th August 2014) and I managed to get a couple of photos if you are interested, I can send them through. We live in Rochester Kent and this is certainly the only one that I have seen. It looks pretty healthy and is certainly quite active. Alan Watson. 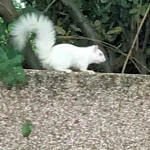 I've just seen a pure white squirrel in Hythe Road Ashford- . Amazing! I couldn't stop to take a photo as I driving and had cars behind me. Time:3.15pm Date: 17/3/14 JulieDurnall. I found your website and just wanted to email to report the sighting of a white squirrel by my son and daughter on their way to school one morning in January this year (2014). It was about 7.50 in the morning and the squirrel ran across the road in front of my daughters car (luckily it did successfully get across the road). This was on the A20 London Road at Aylesford in Kent. Blondie turned up in my garden around Easter 2010. She visits every day and has raised several families, sadly all grey, and some in my garden. I have no idea how she has survived so long as she is very careless around my two cats! This is her dismantling a teddy bear head she found. When one of her dreys got blown apart you could that she had used the teddy stuffing to line her drey. Sian West Malling, Kent. Further sighting in Oaklands Road, Bromley on Saturday 21st July. Stopped car to let him/her cross the road but no time for photo. 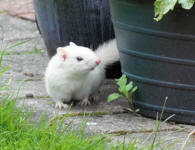 I don't have a picture but last Saturday 9th June 2012, I saw a pure white squirrel in Bromley Kent running around on the lawn of someone's garden. I was fascinated. Kind Regards Margaret Clempson. Not sure if you are still collecting this info but there is a white squirrel living on Molesey Drive, North Cheam. I’ve seen it a couple of times now. Kelly Dolan 25 Nov 2018. A white squirrel was in Nonsuch Park (near Cheam in Surrey) on 7th April. This morning (2 apr 18) I had the absolute pleasure of welcoming a white squirrel in our garden. 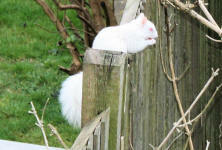 I’ve just seen a white or albino squirrel on my garden fence. It was manoeuvring along the fence following a grey squirrel. 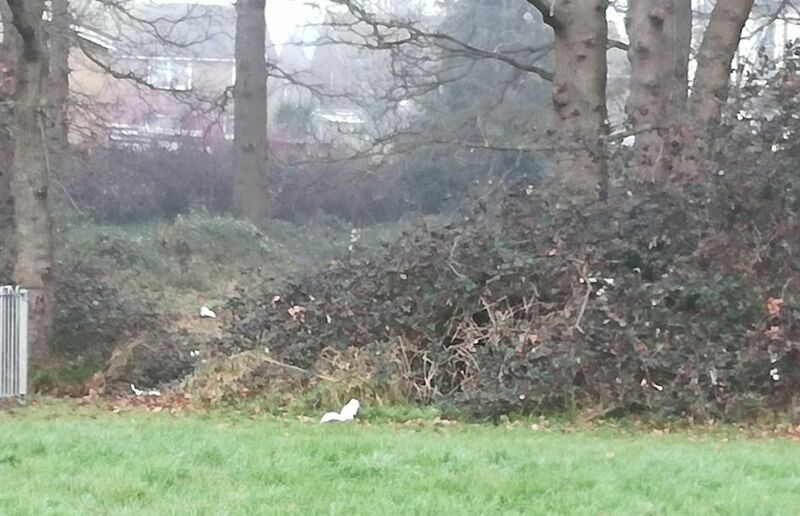 I’ve spotted a white squirrel on the edge of a field in South Nutfield, near Redhill, Surrey. The fields are called ‘Jubilee Fields’. I was walking my dog there on 6/3/18 and tried to get closer to take a photo but the squirrel was very skittish and quickly disappeared into the woodland adjacent to the field. I’ve walked my dog there regularly for the last 4 or so years and have never seen it there before. I just have to report to you that for the past ten days there has been a pure white Squirrel feeding off my bird feeder in South Merstham, Surrey along with garden birds and other resident grey Squirrels. 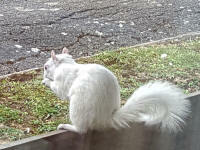 We are staying with my son in Merstham, and this morning spotted a white squirrel. So wonderful to see. Thought I would report to you as I saw your email address on line. Pictures by Caroline D'Monte of squirrels that live in a red at the bottom of her garden. 27th June 2017. Click on the pictures to see them full size. We watched it for a little while but couldn't see the colour of its eyes. It was striking against what was left of the snow from the weekend. I see that someone else has reported seeing one in Chasewater on your site. It must be the same one I suspect. Hi, just seen a white squirrel whilst out walking the dog around Chesworth Farm, Horsham, West Sussex. I thought you’d be interested to know that I saw a white squirrel in Five Ashes on 19th September. Just wanted to let you know that we saw a white squirrel this morning (9th Sept 2018) on our walk in the woods coming off Wolstonbury Hill in Sussex. Sadly we didn't have our he/she stayed in the same spot on the tree trunk long enough for us to have a good look. I saw the white squirrel on the grass verge in Upper Dicker today (27th Dec) ...red eyes and looks very healthy. Such a fantastic sight ! We saw one yesterday by the side of the road in Upper Dicker, East Sussex, and managed to grab a quick photo before it ran off into the woods. I have been watching a white squirrel from my horsebox window for a few mornings now. He /she is too far away with my binoculars to identity eye colour. But is stunning and very active in a copse that belongs to someone else so I can't go and walk there. One was at East Grinstead on 16th March 2017. Nicola Starmer. Just seen one in Grebe Crescent in Horsham. babsfosket 22.2.17. 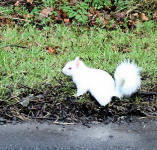 Just to let you know I saw a white squirrel on the outskirts of Peasmarsh in East Sussex yesterday. It ran across the road in front of me and disappeared into a hedge. There was a white squirrel in church St Willingdon on 6th Oct 2016. Paulette Miller. Hi, I'm from Haywards Heath in West Sussex and I've just seen a white squirrel in my garden. The pictures aren't great I'm afraid but here they are in case your interested. Hi, have just seen a white squirrel in Collington woods in Bexhill-on-Sea , East Sussex on 3rd March 2016. Lisa Dixon. 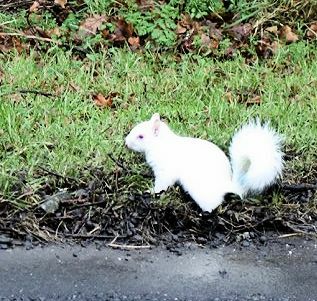 We spotted this white squirrel, which we believe to be leucistic as it has dark eyes, along Spithurst Road, between Barcombe (Lewes) and Newick, last week (w/c 22 February 2016). Sadly, we found him dead on the road a couple of days later. Just saw surprising sight of white squirrel with short white tail doing the run up my cercis outside the kitchen window in St Leonard's on Sea. Was half asleep and so surprised didn't get a pic but will aim to do so soon. Catherine November 2015. A white squirrel has frequently been seen in Oak Bank, Lindfield, West Sussex during Mid September through to early October 2015. I have not seen it this week though. 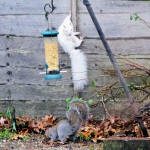 Neighbours reported seeing the albino fighting with grey squirrels but I have not seen that personally. I have been told that white squirrels have been seen in the vicinity of Blackthorns Infants and Junior School in Lindfield - and also in the grounds of nearby Oathall Community College, Appledore Gardens, situated within less than quarter of a mile away From Blackthorns. I saw a white squirrel today playing around some trees on Butcherfield Lane, Hartfield, East Sussex. 19th August 2014. Abie Salter..
Hello John I live a few doors up from your last Burwash (click to find it!) spotter, Brian. We had the squirrel in our garden on Saturday 11th Jan 2014. Just to let you know I have seen a white squirrel in Cuckfield Sussex on Christmas Eve (2013). Sally Phipps 7th Dec 2013. WHITE SQUIRREL - Bexhill on Sea, 3pm Sunday 11th November, Richmond Avenue. 9th September 2012: Hi, just seen a pure white squirrel whilst out walking in the country lane where I live in Eridge E.Sussex. Very shocked as never seen one before. Rita Phillips. Dear John - White squirrel seen this a.m. Bixley Woods 50 degrees 58’ N 0 degrees 38’ E Northwest of Rye East Sussex. I have been walking here on a near daily basis for over two years and this is first time seen. 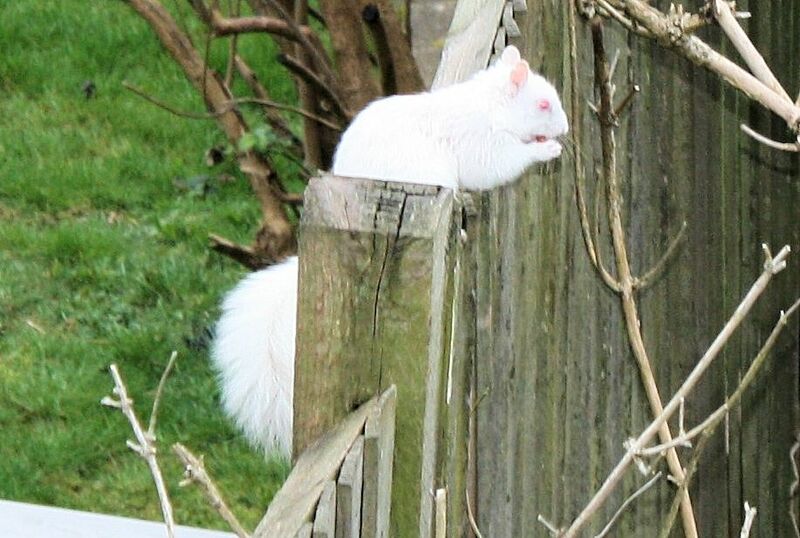 A white squirrel was seen sat on a fence post at the junction of Crookhorn Lane and College Road by Portsmouth golf course on 8th March 2019. My friend spotted a white squirrel on Richmond Road in Southsea this morning at 10 am. Spotted white squirrel on 15th Dec 2018 ,at about 2:15pm,along the path that runs along the southern edge of Crookhorn Golf Course. I saw a white squirrel today in Albany road Portsmouth. I didn’t realise how rare they were till I got home. I managed to take a picture although it’s not great you can see the squirrel. Regards David Lawson. 10 Nov 2018. I spotted a white squirrel a couple of days ago. (3 nov) It was crossing Elizabeth Road Waterlooville near the Mill Road end heading towards the housing estate. First one I have seen for a few years since spotting two or three in the small park area at Ladybride Road. One for the record perhaps. I spotted a white squirrel in Kingston Cemetery in Portsmouth yesterday morning. 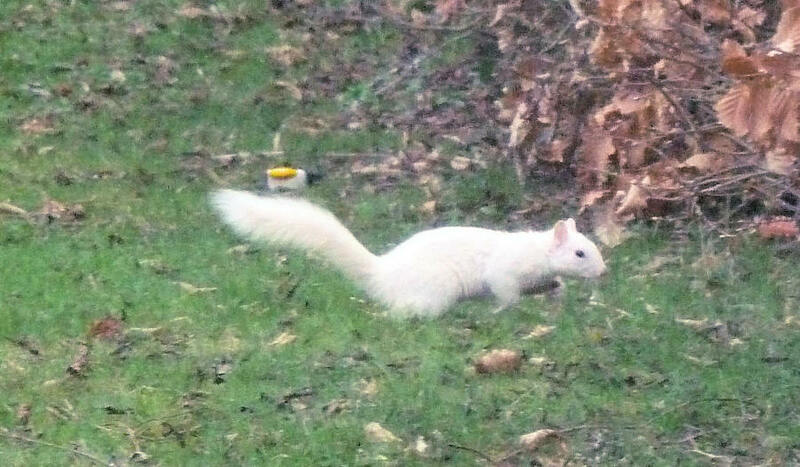 I thought it might be fairly rare (I certainly have never seen a white squirrel?). I wish I’d stopped and actually tried to take some better pictures, but I was on the move and just enjoyed watching it whilst passing. One here in Southsea Seen 9th october.KenJohnson. I am emailing to report a sighting of a white squirrel in Southsea, Portsmouth. The squirrel was spotted today (08.09.2018) at 16.30 running up a tree on Southsea common, opposite the Queens Hotel on Clarence Parade. Saw a white squirrel today just off of St John's road Purbrook in a pine tree near our garden. Absolutely gorgeous. Seen again on 18th Sept 2018when it was confirmed it is an albino. Julie Hodge. There was a white squirrel on east Portsdown on 17th. Louise Baverstock. White squirrel lives in Widley, Waterlooville. Checked through binoculars and it has red eyes. Very cute! Just seen a white squirrel in my garden in Purbrook PO7 area. Couldn’t get a decent photo but will try if I see him again. First one we’ve had in the garden for 20 years! Regards Susan Richardson 15/02/18 Susan managed to get her photo on 27 april! I saw a white squirrel this morning on my way to work. I was driving from my home in Waterlooville to Havant along Hulbert Road and it was at the edge of the wooded area, just before the Havant ASDA . It was sat there happily holding something in its paws and munching away. It looked a little scruffy, a little dirty but it was definitely white. At about 15:30 23rd January 2018, we saw what looked like an albino squirrel. A white bushy tail and a bright red/ pink eye. It was in Hulbert Road on the Asda side. We were so shocked to see it. Just seen an albino squirrel down the Hulbert Road (Havant) on the side of the road looking for food , was quite surprised as not seen one before! Had quite distinctive pink eyes! John – my wife and I have both watched the same white squirrel as Jane Powell (See below), in the trees adjacent to the Pembroke Bowling Club. It’s definitely an albino, as it clearly has pink eyes. We’ve got a few photos and a couple of videos of it. My husband and I saw an albino squirrel as we were driving into the Waitrose car-park in Waterlooville ton 6th Jan 2018. Just done a long Christmas Day walk along the seafront in Southsea Portsmouth and walked back by the Garrison Church and saw a white squirrel at the base of a tree and when it sensed us it ran up saw it x 3 but not quick enough to take a photo sorry. Sorry no picture I’m afraid but one albino squirrel spotted at the Southsea bowling green on Pembroke park road. Ran up a tree before being chased by a couple of greys. Hi there, today while walking through Kingston cemetery my husband noticed a white squirrel. We managed to get quite close and noticed it had red eyes too. After researching a little we've come to realise that they are quite rare and thought you may be interested. Regards, Maria Fallon. I have spotted a white squirrel in Portsea area, just behind York Place. Thought you might like to know. I saw a beautiful white squirrel on The Dale this morning in Widley . We used to see one a few years ago but none for a long time. Saw this white squirrel yesterday in Kingston cemetery (Portsmouth) while visiting loved ones,never seen a White squirrel before what a lovely creature B-) Evie 24th June 2017. Just came across your page by chance. We spotted a white squirrel in the Kingston cemetery in Portsmouth at the beginning of January. I spotted an albino squirrel with the red eyes showing clearly in HMS Nelson wardroom gardens on Queens street Portsmouth. Bernie Quinn 10th November 2016. Just dropped my daughter off at Oaklands Catholic School in Waterlooville and we saw a white squirrel at the treeline between the school bus stops on the drive and St Peters School next door. Hello, whilst my son was looking for Pokemon at Kingston cemetery behind Kingston prison in Portsmouth today he spotted an albino squirrel. From Lisa Fothergill, Copnor. Hi I saw 2 white squirrels in the woodland behind the park in Elizabeth Road, Waterlooville on Sunday 12th june. Managed to get photos and a video. Was lovely to see as I've never seen one before let alone 2! Seen many times at Waterloo School, but never when the children at school. On sunny days can be seen sitting on the roof of the school, or chasing its grey relatives around the park and playground. Nicknamed 'Frosty'. Annette Webb Jan 5th 2016. I regularly see a white squirrel in Malvern Park, off Clarendon Road, Southsea. But I am told that there is a family of three living in one of the trees there, so I may not be seeing the same one each time (most days). Certainly very pretty and much more tame than their grey brothers. Marion Wenden 4.1.2016 Also seen by Pat Earl and Fay Durant. 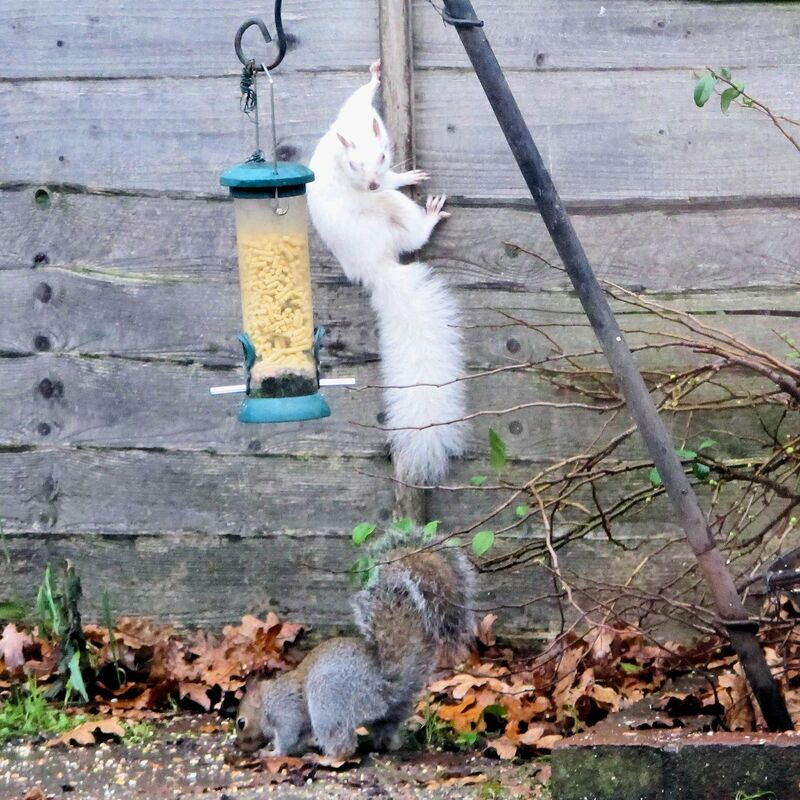 On 30th Dec a white squirrel was seen in Clarendon Gardens Southsea by Uta Cobley. I saw a white squirrel on Dec 27th 2015 while waking my dog in Johnstone's coppice Waterlooville. Lehann Richardson. I have lived in Waterlooville for 16 years – my back garden is surrounded by trees and we see grey squirrels daily, however, in 16 years I have never seen a white squirrel until today. I watched it for 2-3 minutes but when I went to get my camera it scampered off – hopefully to return again soon. It appeared to be in good condition and was a very clean white colour, making me thing it was albino, but I couldn’t get a picture or determine what colour eyes it had. I will keep you posted if I see it again or get a picture. Regards Pete Lydford. Hi, my son lives at Woodsedge Waterlooville down at the Sorrel close end. He has frequently seen a pure white squirrel in the woods between him and the Am. 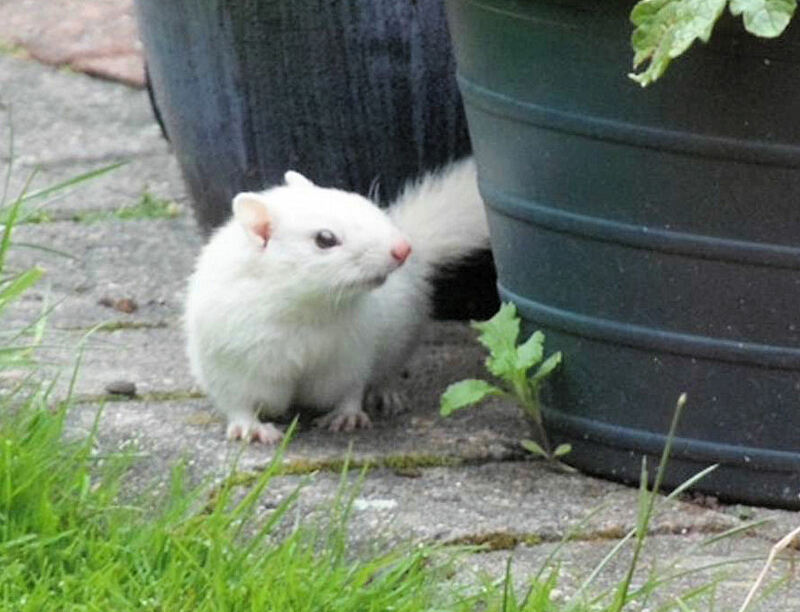 We have a white squirrel visiting our garden in Waterlooville in Hampshire August 2015. Linda Gooderham. I spotted a white squirrel in Horndean two days ago (25th May). He/she ran across the road and up a tree. Graham Petrie photographed an albino squirrel in Southsea on the corner of Villiers Road on 10th Feb 2015. I have never seen a white squirrel until today. I googled it and stumbled across your blog. I was driving through Southwick Park (Hants) and one ran across the road. Was gob smacked, beautiful little creature. Have seen a white squirrel today as I left Southwick Park golf course- it was pure white and a surprise as have never seen one before. Today whilst walking the dog, my husband saw an albino squirrel in the copse at the rear of Holly Drive Waterlooville. Hi John, there are 3 white squirrels that visit the garden where I live in Southsea. I was amazed to see them all together in the garden. Pauline Hopkins 23rd Dec 2013. Had a good, close-up view of a healthy-looking white squirrel on Frogmore Lane, Lovedean this morning -18th June 2013.. (I have not seen one there for months until now). Working on the FX onboard HMS Diamond this morning about 0900 I came across a white squirrel. It jumped off the ship onto the jetty (in the Portsmouth Naval Base) about 20 feet down. I first thought it might have been a flying squirrel, as it jumped it opened its front legs out to the sides slowing its decent but looking at pictures online I am pretty sure it wasn’t. Regards LS AWW Perrett 3rd June 2013. Happy New year!! :-) Brgds, Mike Reed. Our garden backs onto the woodland that runs between Phillip Road and the lake/reservoir along Elizabeth Road in Waterlooville/Purbrook. We are very fortunate to have two White Squirrels who live here as well as many Greys. I always have a daily supply of nuts (and now sultanas as they appear to be a favourite!) in the garden for them and our garden is very rarely squirrel free between 9am – 3pm! In regard to the mentioned Whites, the slightly larger of the two is a daily visitor and is not bothered if l am sat in the garden when he (or she) arrives, in fact he has even ventured to the back door when l was an hour late putting out the feast! I have attached some lovely pictures of him for you. These were all taken in our back garden. The other White is very slightly smaller and only has half a tail! He isn't such a regular visitor but has been around more often over the last couple of weeks. He also isn’t as easy to photograph as he is a lot more nervous and shy in comparison! All the squirrels that visit us are very amusing and definitely pleasant timewasters! On our walk today we met a white squirrel routing slowly through the undergrowth in our nearest “bluebell” wood below Upham village, Hampshire. He had a beautiful fluffy tail and was unfazed by our approach; he just gazed up at us, under our feet, with his pink eyes (he was that close) and then carried on with his explorations. Unfortunately we did not have our camera with us but we could have taken some wonderful close-up pictures. 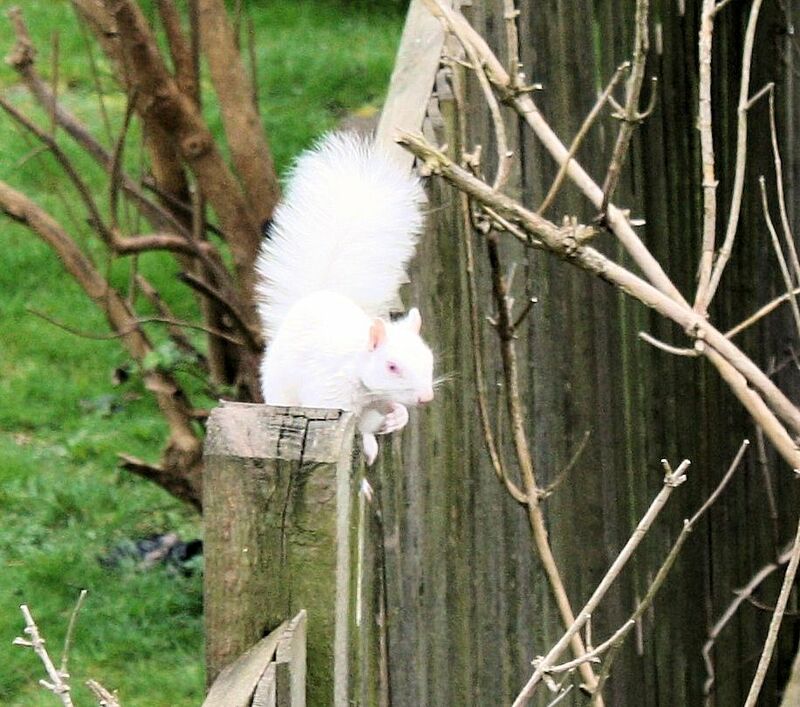 A white squirrel was on the small piece of land near Pier Rd Southsea—opposite the Holiday Inn this week. w/e 15th Oct 2012. This animal was seen again in w/e 18th Nov 2012. White squirrel in Sandy Dell again this morning. A local resident informed me that there are three there. Adele 31 Oct 2011. I can’t guarantee the truth of reports that are three at Sandy Dell but I saw with my own eyes two there this morning happily foraging alongside two greys. Adele 7th Nov. I am not sure you need this info. I first reported seeing one several weeks ago in the same place - and I see from your Newletters that you are getting other sightings of more in other areas. Anyway, I thought I would send to you again, just in case it is of interest... Katie Mann 22 Nov 2011. Saw white squirrel in my back garden Couple of months ago. Rushed to get my camera but it was gone when I returned. I live in Southport Northwest England. Submitted Dec 2014 by Paul Whelan. white squirrel in Blackpool 16/17th August 2013. Jill Webster - click for her picture of the squirrel. I live in Louth, Lincolnshire and my husband has today spotted a white squirrel in the wooded area behind our house! He looked at the pictures and says it was white and had black eyes, so not an albino. It was slightly bigger than the gray squirrel it was chasing and had a big white fluffy tail!! They are commonly sited in the Crystal Palace area of south London, particularly Farquhar Road and South Norwood. From my own sightings (twice a couple of months ago, once last year), they are albinos, and the regular spots on local Facebook group pages bare this out. Spotted in Earlsfield London. Magdalen rd cemetery. Tina Green 26 Feb 2017. Mark Nourse managed to get a distant shot of a white squirrel in Cheam on 1st May. I saw a white squirrel in our garden on the morning of Thursday 9th November. I live in Duston, Northampton and it is the first time I have ever seen a white squirrel. I spotted an Albino Squirrel in my back garden in Northampton, I didn't think much of it until I looked it up on the internet! 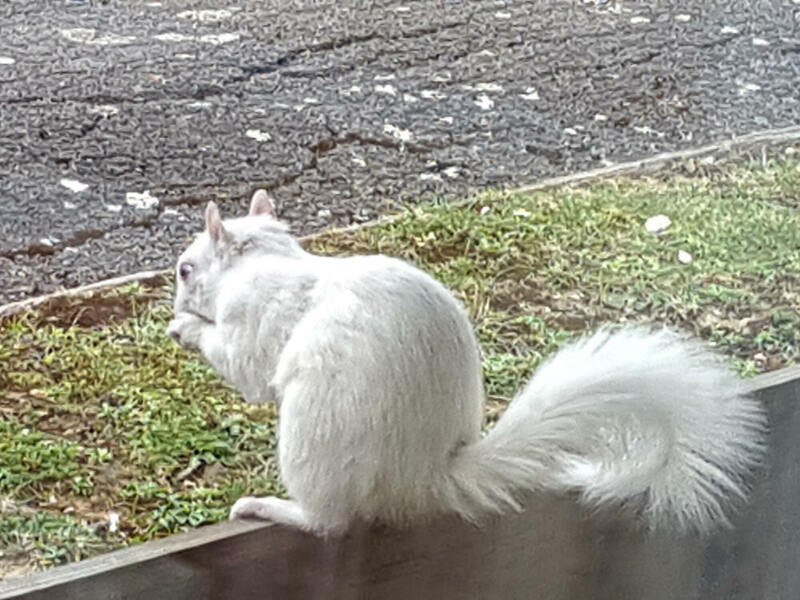 Don't know whether you are the right person to report to but I saw an albino squirrel today - being chased by a grey squirrel - in the garden of my partner's house in Nottingham - NG35DF - don't know if that's of any interest to anybody but I understand they are pretty rare (very pretty!). I spotted a white squirrel today (3rd Nov 2017) at Berrywood hospital in Duston Northampton. It was running around the car park. I tried to photograph it but it was very quick. My dad watched it while I went for my treatment. He said it had pink eyes. The nurse said it is a regular visitor and she has a photo, which may be better, if you need one. Spotted white squirrel today 5th February in the trees behind our house in Narborough, Leicestershire. Gone before time to photograph. Regards James Walker 20 Jan 2014. I have a cute little white squirrel in my back yard in Huntsville, Alabama. He’s pretty quick and shy, and high up in the tree, I can’t get him with my cell phone, I can’t get a picture. At first I thought I was crazy. But, today April 20, 2013 I watched him for a while...amazing, absolutely amazing. he is a bit fussy. E Mail from dryalstone. Hi I saw a white squirrel in Kenilworth Cape Town South Africa couldn't snap it for you as I was en route somewhere. Adele Mallows pictures on 30th April in Purbrook. This is Michael Kozdon's picture from Gloucester 18 March 2012.